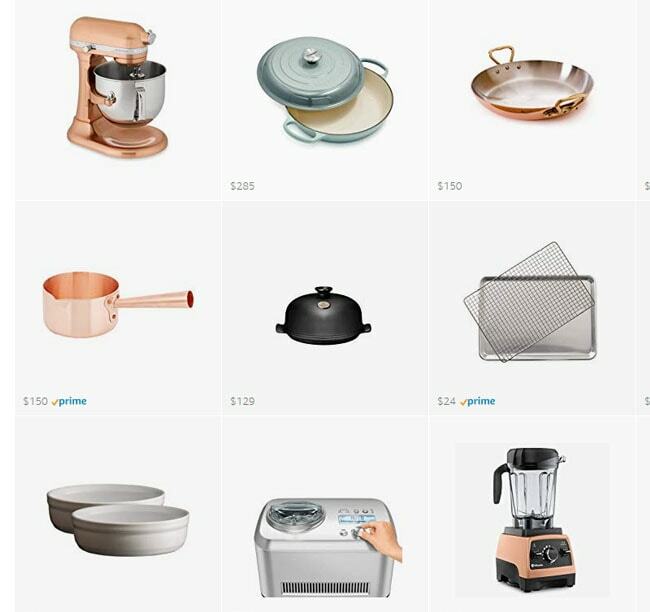 Every year, I have good intentions of putting together a gift guide here of all my favorite cookbooks and kitchen items and whatnot, and every year, I never get around to it. So this holiday season to make up for lost time! I have quite the list for you. Today’s gift guides are all books, so if you are not into that I apologize. However, I think books are the best gift to give and get, and so I can’t not make a big long list of all my favorites. But stay tuned: I will have kitchen items, non-cookbooks, and a kids’ guide for you soon. And! I’ve been working on a Holiday playlist over on Spotify, which you can find here. I’ll be adding to it a little more here and there. Sweeter Off The Vine by Yossy Arafi – Here are beautiful photographs, recipes that always work, and a unique perspective on baking. I absolutely love Yossy’s book, and turn to it often. Favorite recipes: Yossy is known for her pies, so anything involving pie crust is a winner (see Cherry and Rhubarb Slab Pie, Pear Pie With Creme Fraiche and Caramel, and Tangerine Cream Pie), I also love her Old-Fashioned Blood Orange Donuts and Apricot and Berry Galette With Saffron Sugar. Breaking Breads by Uri Scheft – The first time I paged through this book I couldn’t stop whispering gorgeous at each and every photograph. The book succeeds at revitalizing ‘traditional recipes to suit modern tastes’. It is beautifully photographed, and includes helpful process shots for complicated recipes. On my to-do list: Marzipan Challah, Ricotta Streusel Babka, Sufganiyot (similar to a Boston cream doughnut), and Sticky Cinnamon Challah Snails (there are plenty of savory bread recipes, too, but I always gravitate towards the sweet). Marbled, Swirled, and Layered by Irvin Lin – Irvin’s book came out one week before mine, and it’s packed full of really great recipes with some serious twists on classics. Everything from cookies and bars, cakes and cobblers are covered in this book. I honestly can’t stop thinking about the Pumpkin S’mores with Maple Brown Sugar Marshmallows and Dark Chocolate (dang! 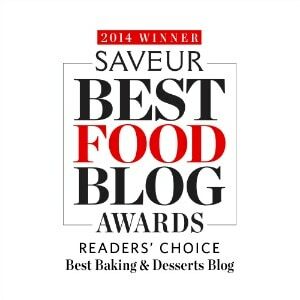 ), and can’t wait to try the Seville Orange Bars With Salted Shortbread and Gin Meringue. Classic German Baking by Luisa Weiss – I haven’t had a chance to start baking from this book yet, but have started reading it cover to cover, inspired by both Luisa’s writing and recipes. I’m starting with the Franzbrotchen (cinnamon-sugar buns) because they are the prettiest little buns I’ve ever seen, and I think they will become best friends with my tummy. Also the Brezeln (soft pretzels) are gorgeous, and I’ve always wanted to make Apfelstrudel but never have attempted, so this winter it’s on. Golden by Itamar Srulovich & Sarit Packer – Golden comes from the ovens of London’s Honey & Co, which I have sadly never been to (one day, London, one day), and it is another book that I have a major to-do list for. Again, I’m drawn to the sweet (although there is savory here, too): Pistachio, Rose, & Strawberry Buns, Sweet Cheese Buns, Lemon Drizzle Cake with Elderflower and Marcarpone Icing, and Baked Apricots with Marzipan Filling and Almond Crumble are good starting points. Panetteria by Gennaro Contaldo – Another gorgeous book, featuring Italian baking. I am smitten with the process shots featuring Gennaro Contaldo himself; they capture so beautifully the artist giving his life over his work: knowledge and pleasure and grace are in all the movements of his hands. I’m starting with the Focaccia Al Sale (Basic Focaccia with Sea Salt), then moving to mini pizzas with mushrooms and the Plum Cake Di Anna (chocolate chip and ricotta loaf cake). 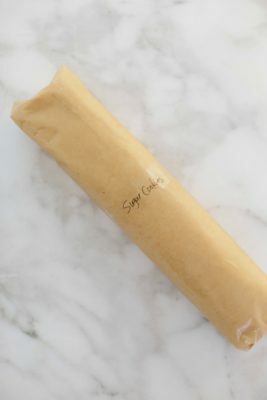 The New Healthy Bread in Five Minutes A Day by Jeff Hertzberg and Zoe Francois – If you’ve been following along here for awhile, you probably already know that I contribute to Jeff and Zoe’s Bread in Five site quite frequently (in fact, they have a giveaway going on right now for my book). I worked on this latest book with them as well – a week long photo shoot with lots of baking and food styling and washing dishes and fighting over music. It was a blast. This edition is revised and updated with new recipes. I love the Whole Wheat Brioche, Whole Grain Doughnuts (covered in cardamom-ginger-cinnamon sugar, of course), and the Whole Wheat Christmas Stollen is a must this year. Elements of Pizza by Ken Forkish – I was lucky enough to visit Ken Forkish’s bakery this summer, but I sadly didn’t make it into his pizza shop. Luckily, there is this book. The beginning chapter of this book ‘The Soul of Pizza’, is moving, highlighting famous pizza bakers and shops all over the world. I wanted to fly to each one, eat pizza forever, and then come home and try to recreate it. As that is not an option, luckily Mr. Forkish got to do that for me. I’ve made Grandma’s Pie (a sheet pan pizza) more times than I can count, and it is a family favorite every Friday night. The Art of Pie by Kate McDermott – A wonderful book about making and baking pies. Ms. McDermott has been baking pies for years and years, and even has a pie camp (which sounds totally dreamy). The book is filled with practical tips and helpful information on making great pies, and whole chapters on making the crust, thickeners, and the Quintessential Apple Pie. Sounds like the perfect way to spend Christmas break to me. 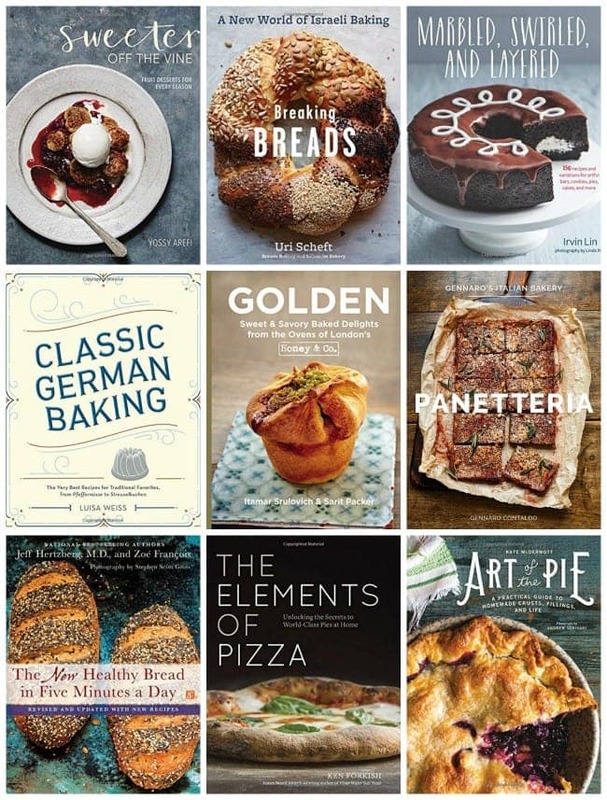 Other baking books to check out: Bread Illustrated by Test Kitchen has some great recipes (like kolaches! 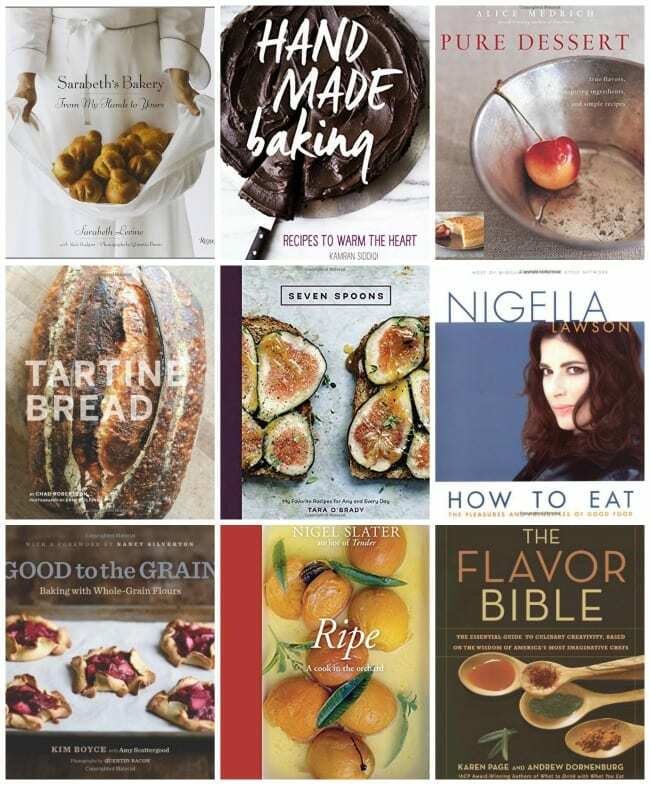 ), The Alternative Baker by Alana Taylor-Tobin for the gluten-free bakers in your life, Layered by Tessa Huff for baking, building and styling cakes, and The Everyday Baker by Abby Dodge won both an IACP award and a James Beard award, making it a total winner. Molly On The Range by Molly Yeh – Molly’s new book is just as lovely and funny and fabulous as Molly herself. The photos are gorgeous, the illustrations lovely (there is even a page to color!) and the writing engaging. I’ve made the Dark Chocolate Scone Loaf, my kids are obsessed with the Chicken Pot Tot Hotdish, and there are so many things on my must-make list: Honey Ricotta Blintzes with Caramelized Onions, Scallion Pancake Challah, Rosewater Marshmallows, and Ginger Snow Cones. Martha Stewart’s Vegetables by the Editors of Martha Stewart Living – This might be my favorite Martha cookbook (although, the Baking Handbook is pretty great). It is a beautiful collection of recipes, with simple yet lovely photographs for almost every recipe. Most recipes are savory, with a few sweet mixed in. I’ve made the Parsnip Cupcakes With Cream Cheese Frosting, and will soon try the Cornmeal Shortcakes with Corn Ice Cream and Blueberry Compote, Braised Chicken and Brussels Sprouts, Beet Risotto with Beet Greens, and Skillet Pizza with Greens and Eggplant. Modern Potluck by Kristin Donnelly – I grew up in potluck culture, so I was excited to see a modern take on something that scared me as a child (there are some pretty funky hotdishes that get brought to a church picnic, let me tell you). Kristin’s book does not disappoint, with plenty of delicious and un-scary meals to share with friends and family: Late-Summer Enchilada Pie, Smoky Squash Mac & Cheese, Grilled Corn Salad with Lime Mayo, and Greek Expat Potato Salad. And, since we were the family that only brought dessert to potlucks (bars, of course), I was happy to see plenty in the ‘Sweets’ chapter – Potato Chip-Crusted Magic Bars, Lemon-Olive Oil Zucchini Bread, Peach-Blueberry-Slab Pie, and Cranberry Jam Streusel Bars with Walnuts all sound good to me. Simple by Diana Henry – I only discovered Diana Henry a year ago, although she’s been writing books for quite awhile. Sometimes I’m not hip to the scene. 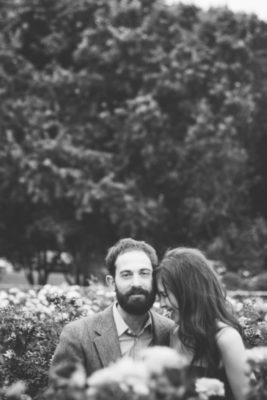 I was instantly smitten with her prose; her books are the kind to curl up by a fire with, with hot coffee and something sweet for nibbling within arms length.’ You know the scenario. You’re home late. You’re tired and worn out. You could murder a bag of potato chips and a gin and tonic (and consider pouring yourself a glass, even though the tonic has gone flat.) This is the kind of night when you need a treat. Self-control has no place here. The key thing, though, is to give yourself a treat worth having: a slightly luxurious meal, but one you can make quickly’ (my favorite lines, from her book, A Bird in the Hand). Coffee-Brined Pork Chops with Hot Sweet Potatoes sound right up my alley, as well as Roast Citrus, Ginger, and Honey Chicken. The Lemon and Lavender Cake looks perfectly lovely, but Bitter Flourless Chocolate Cake with Coffee Cream might be where I start things off. Also, when Yotam Ottolenghi writes on the back of your book that ‘Everything Diana Henry cooks I want to eat’, you know it’s going to be amazing. Love & Lemons Cookbook by Jeanine Donofrio – This cookbook is what I aspire to in my everyday eating life: simple, clean recipes that bring healthy to my mind and body. In reality, there is too much butter and sugar in my way to make this a reality, but I do try. The photography throughout the book is gorgeous, and you will want to make everything: Strawberry Salad with Toasted Hazelnuts, Roasted Cauliflower and Red Pepper Soup, Spring Onion Pizzas, and Swiss Chard and White Bean Tacos are on my current list. A great cookbook to give on Christmas to help someone jump-start the New Year with good eating. The Farmette Cookbook by Imen McDonnell – I had the pleasure of meeting Imen this summer, and have so enjoyed her beautiful book. ‘Recipes and Adventures From My Life on an Irish Farm’ is the subtitle, and as you can imagine, the book is filled with gorgeous photos and unique recipes from her life in Ireland. I swooned over the Hazelnut and Vanilla Slice, and have so many items up next to make: Queen of Puddings (jammy cake covered in piles of meringue), Smoky Dark Chocolate Porter Cake, Irish Pancakes, and Sweet Farmer Cheese Danish with Elderflower Glaze. There are plenty of savory recipes, too. The Vegetable Butcher by Cara Mangini – I really like this book. As someone who grew up all meat and potatoes, cooking with a huge variety of vegetables is not my forte. Not because I don’t like how they taste, but often because I don’t exactly know how to cook them best (ask my husband about disasters with eggplants part 1 and 2). This book is incredibly helpful – it shows how to cut vegetables properly, gives the author’s favorite cooking methods for simple, straight-up cooking, and then highlights favorite recipes for each vegetable. There are also plenty of butcher’s tips and butchery essentials. So simple, yet so genius. It’s a great gift for a new cook, or someone (like me) who isn’t always quite sure the best way to roast an eggplant. Phoenix Claws and Jade Trees by Kian Lam Kho – I am determined to learn how to cook Chinese food well this year. Both my kids go to a Chinese Immersion school, and as they are constantly surrounded by Chinese culture, they often want to eat Chinese food (although, I don’t speak Chinese, and always want to eat Chinese food, too). But, in all honesty, I’m not great at making it in my own kitchen. Enter this beautiful, beautiful book by Kian Lam Kho. I’m completely smitten with it, and have been reading it like a novel, unwilling to put it down. 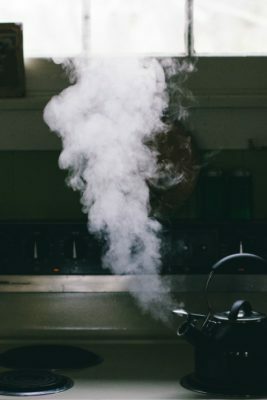 Chapters include ‘Harnessing the Breath of a Wok,’ ‘The Virtues of Slow Cooking’, and ‘Enriching With Smoke’; all focusing on mastering techniques while providing references to history and culture. If you are even the teeniest bit interested in cooking Chinese cuisine, this book should be in your cookbook library. 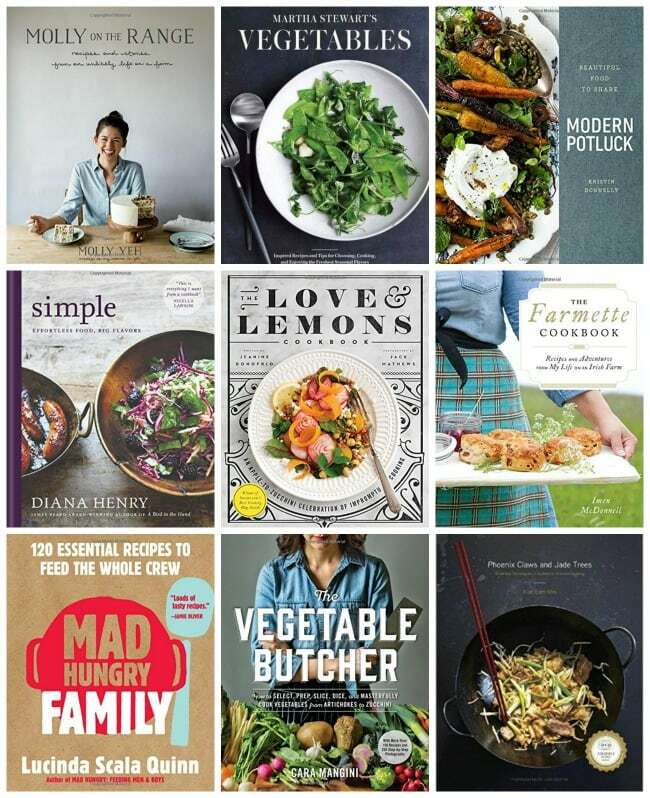 Other cooking books to check out: Small Victories by Julia Turshen is beautiful and so well-written, The Gourmet Kitchen by Jennifer Farley: a great collection of recipes ranging from breakfast to dinner, and of course, dessert, Adventures in Chicken by Eva Kosmas Flores, a book of chicken recipes sure to please everyone. SaraBeth’s Bakery: From My Hands to Yours by SaraBeth Levine – This might just be my favorite baking book. It’s definitely the one that made me fall in love with laminated doughs. The photographs are quiet and beautiful, there are process shots to help with complicated recipes, and everything I’ve made has turned out perfectly. I’m especially smitten with the puff pastry dough as well as the danish dough. It’s a gorgeous book, and a good addition to any baker’s library. Handmade Baking by Kamran Siddiqi – Another really great baking book. Kamran’s Quick Puff Pastry recipe is fantastic, and his Everyday Chocolate Cake is A++. The photographs in this one are stunning, and the recipes are classy but approachable, which sort of reminds me of Kamran. (We’ve never met, but he comes across online as kind and classy and thoughtful.) Another book I use all the time. Pure Dessert by Alice Medrich – Alice Medrich is the baking cookbook queen. I appreciate all her books, they are so well done: flawless recipes, and solid writing and research. Pure Dessert is the first Medrich cookbook I ever owned – all the rest had been checked out time and time again at the library, when I couldn’t afford my cookbook habit. This one is special, and helped pave the way for baking with alternative flours as flavor flours. The Nibby Buckwheat Butter Cookies are holiday favorites. Tartine Bread by Chad Robertson – Want to make the best sourdough bread ever? Chad Robertson will teach you how. I have made the Basic Country Bread, starting from the beginning and making my own starter, feeding it every day for two weeks, and then then making the leaven and mixing the dough. It was work, but worth all the time. The loaves turned out lovely and delicious, and when I have the time, they are a favorite to make. This is a great gift for anyone interested in making bread. Seven Spoons by Tara O’Brady – I’ve had a crush on the Seven Spoons blog for a long time – Tara’s writing and photographs are captivating – evoking both thoughtfulness and stillness to one’s soul. Her recipes have always been winners, so when she put out her own book, I knew it would be well-loved in my kitchen. This book is worth every cent for her biscuit recipe alone, and also for the Vietnamese-Inspired Sausage rolls (which I made once at a party and they disappeared in 4 minutes flat), but there are so many other good ones as well: Bostocks, Caramel Apple Pie, Twangy Blueberry Sauce, Bee-Stung Fried Chicken, and Chicken and Couscous with A Punch Relish just to name a few. How To Eat by Nigella Lawson – The recipes are great, but I love this book for the head notes alone. Witty, honest, thoughtful, and evocative, Ms. Lawson appears to effortlessly express how she feels about food. There are no photographs, just endless word pictures. Good To The Grain by Kim Boyce – Another cookbook celebrating flavor flours, and another book with A+ recipes. 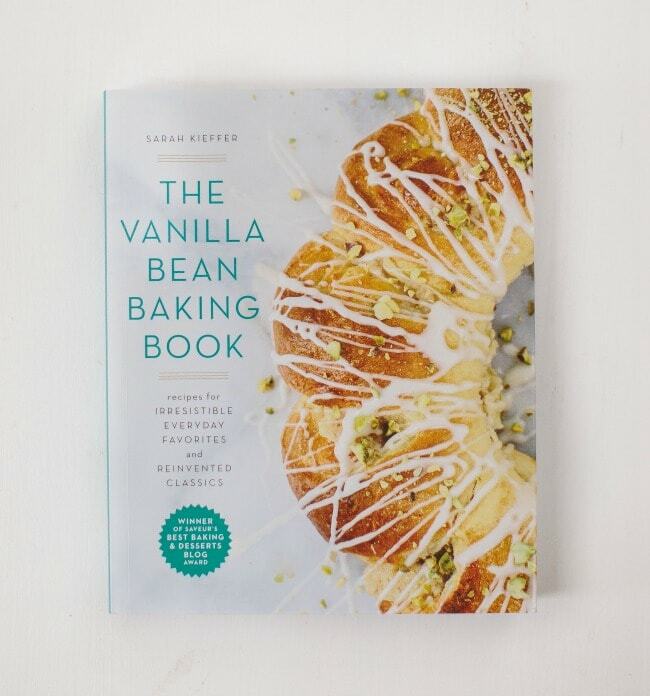 I’ve made a lot of sweets from this book, and they all have been stellar. Chocolate chip cookies made with only whole wheat flour, Pumpkin Pancakes, Pear and Buckwheat Pancakes, Iced Oatmeal Cookies, Banana Walnut Cake, Spelt Pie Dough, Olive Oil Cake, Grahams, Ginger-Peach Muffins, and Onion Jam have all been wonderful. something to take our time over. The Flavor Bible by Karen Page and Andrew Dornenburg – I use The Flavor Bible constantly. It’s a guide to modern flavor pairings, and an invaluable resource. Making something with peaches but not sure what flavors to use? Just open your Flavor Bible, and in alphabetical order, you’ll have a list of everything: allspice, almonds, basil, brandy, creme fraiche, ginger, hazelnuts, lavender… the list goes on and on. There are also notes from well-know chefs giving their favorite flavor recommendations as well. 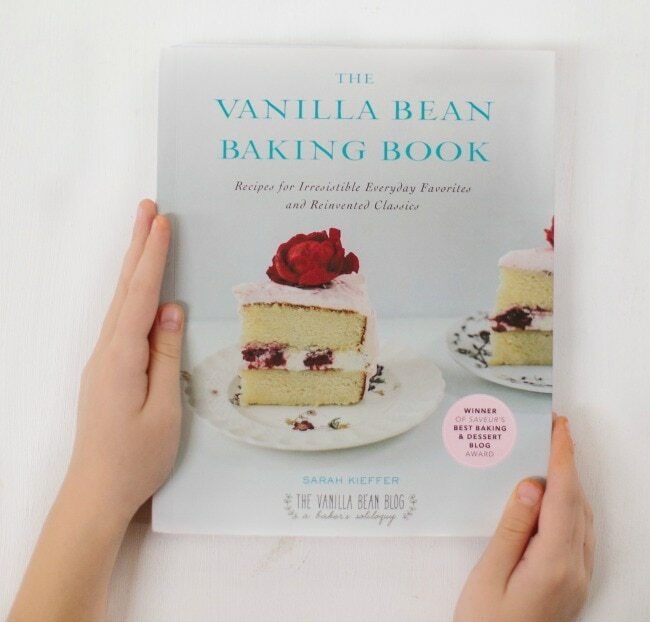 It’s a great book for anyone who loves to cook and bake. As I’m sure you know, I share your deep love for cookbooks. So I loved reading through this list to learn why you love each particular book. SaraBeth’s Bakery was one of the first books I bought myself and it’s still one of my favorites as well. My 2 recommendations from it: the chocolate chubbies (Robert and I made them together on one of our first dates), and her cheesecake with the shortbread crust. It’s the only cheesecake I’ve ever truly liked. 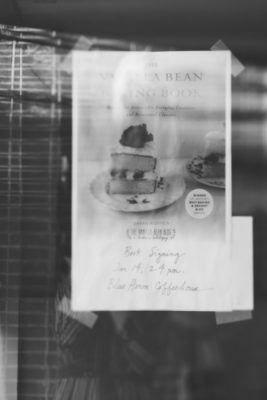 I’m a huge cookbook lover too – something about having a actual, physical paper to page through, their smell, sitting down with a coffee to just read a few pages and being able to pick it up at any spot. I just acquired Molly on the Range and Sweeter off the Vine and can’t wait to start cooking from them! Will definitely check out the rest on this list too. Fabulous. FABULOUS! And yes about Nigel Slater. He’s my personal very best friend, did you know? I don’t think he knows, ha ha ha! I own every.single.one. of his books! And ooooh Diana Henry. I long for this newest book. Do you know her book ‘Roast Figs Sugar Snow’? Magical. What a great list of books!! I want them all for myself! What a great list! This is going to make my life so much easier when I’m shopping this year! I want them all! Great round-up and ideas for a foodie. 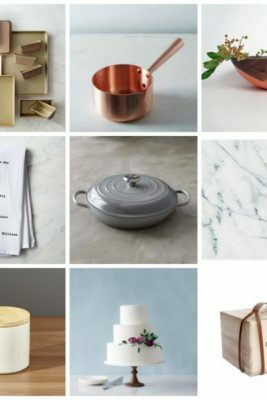 gift guide 2016: part two (kitchen favorites, not cookbooks, gifts for kids) + a minted giveaway!